Why should your organization care? Do you work in Global Fund resource mobilization? Are you a service provider? The Robin Hood Tax is one of the most important and tangible means we have right now to fill the gap in financing. 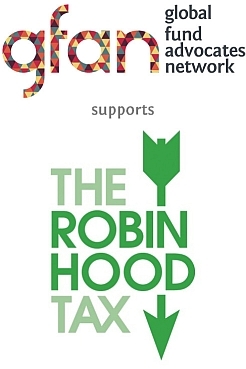 If we don’t act to make the Robin Hood tax a reality, we will all be losing out on up to €35 billion a year that will potentially support global health, development, climate change and poverty initiatives around the world. We cannot afford our cost of inaction. Reaching One Million signatures on this petition is an important milestone that could raise the profile of the campaign and GFAN members can make a huge contribution by being part of the final push to get us over the line. Unions, NGOs and other organisations have been touring across Australia, drumming up support for an FTT, with the aim of finishing at the G20 in Brisbane this weekend where they plan to take an FTT proposal to world leaders: see more here. Recently Finance Ministers of France, Italy and Spain have been heavily criticised for their efforts to water down legislation for the Robin Hood Tax by more than 1000 civil society organizations from 11 European countries, representing more than 50 million European citizens. Read their statement here.